Qatar is a country where along with a host of other products automobiles are imported.One can find all the cars of the world - mostly of the middle and high ends- plying in the streets.Japanese, American, German, French, British, Italian, Swedish, Korean...the list can go further. Japanese cars of Toyota ,Nissan and Honda are very popular among expatriates. Mercedes and BMW brands are common among nationals . 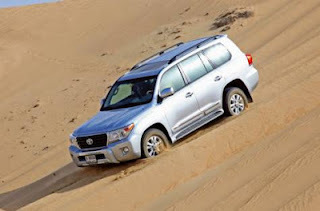 Sight of a Ferrari or a Rolls Royce or a Porche or a Lamborghini is not uncommon on the roads.Hummer came in all of a sudden and vanished in the same speed .But hold, there is a favourite brand among nationals .It is a Toyota Land Cruiser! 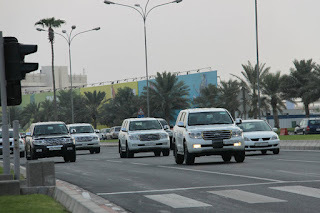 The roads of Qatar are packed with LCs! 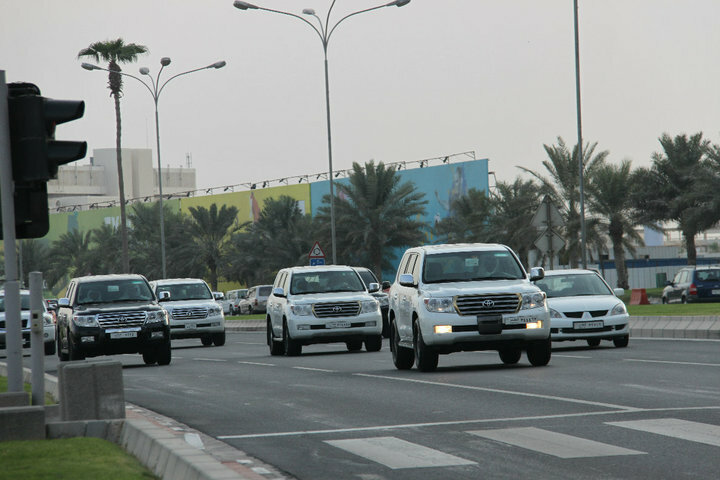 Young , not very young ,middle aged ,reasonably old - all Qatari men love to drive this leviathan.Young ladies too . VIPs , IPs ,common man among the nationals drive this LC which is omnipresent,ubiquitous in city roads, highways,desert roads alike.Interestingly nationals prefer white colour .Pearl white to be precise. So many LCs ,90% of the total number flashing this colour is seen to be believed . Police force also uses a lot LCs. Doha , capital of Qatar was a sleepy fishing village in the fifties. Economy of the country itself was depending on traditional business of pearl harvesting. Invention of cultured pearl by Japan dented the pearl business elsewhere including Qatar. But soon oil exports of the country made a change here. Developments of the country were started in the sixties and speeded up in seventies.It must be in these years automobiles started imported to the country en masse. 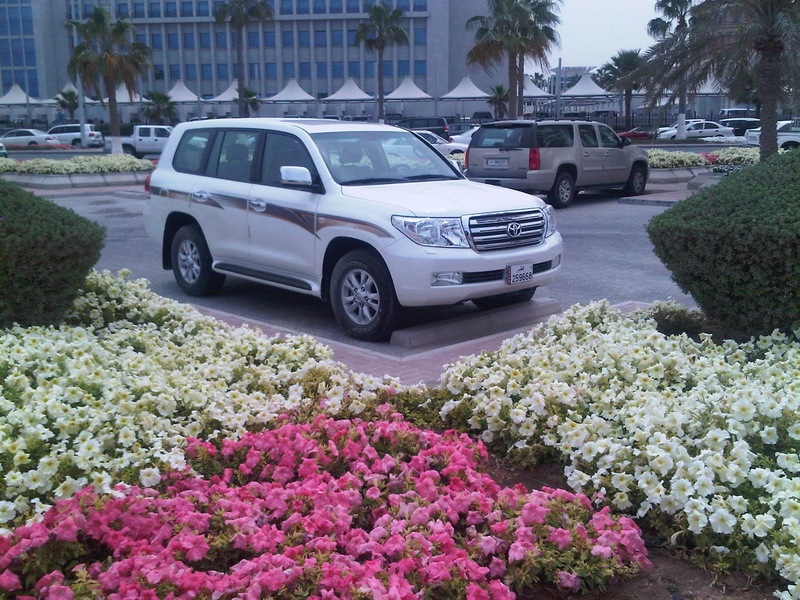 Soon LC found its place in Qatar. It was in late nineties and thereafter developments in Qatar got into top gear . A vibrant phase of systematic developments continues to date with excellent futuristic planning.Qatar which essentially floats on oil and natural gas ,has the highest per capita GDP on earth now. Now the expatriate foreigners in the country outnumber citizens almost five to one!! Other than the buying capacity , blend of tradition ,modernity and reliability along with power and luxury might have made this SUV the dearest for the national . 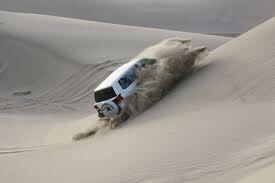 LC , they say is ideal for dune-bashing ,a sport practiced by the young in the country. It is also could be favourite among those who practice falconry . It is wonderful in beaches and for outings. Understandably resale prices of LC is much higher comparing to others. Being modern 'ships of desert' but easy to handle in city roads also might have contributed Qatar to be a Land Cruiser land.